Palm Bay: Missed The Memo That “Offensive Speech” Is Still Protected Free Speech. We didn’t make it to last night’s Palm Bay City Council meeting. We are glad we didn’t as it may have been the first time our representative would have been thrown out of a meeting. Part of the reason we did not attend is personal, but a small part was because of something of which we missed from the February 15, 2017 meeting. At that meeting, the City Council passed an addendum to the Council procedures that requires a citizen to submit “visual materials” for “screening” and approval by the City before they can be shown. A. Members of the public wishing to use electronic media when addressing city council must provide the electronic file to staff for screening no later than noon two (2) business days prior to the meeting. Screening ensures that the material is in a format capable of broadcast or presentation over the audiovisual system, and assures that the material is legally appropriate for broadcast over the audiovisual system and cable. No visual materials may be displayed through the audiovisual system that City staff has not screened. No visual presentations containing offensive material will be displayed or utilized in any fashion. 1. Visual materials include any visual or textual items that are to be displayed through the audiovisual system irrespective of their specific format or media. This includes, without limitation, photographs, audio and video presentations, charts, computer presentations, computer screen images, posters and flyers, whether in physical or electronic format. 2. Visual presentations during public comments are limited to times outlined above in this Section. B. Visual materials do not include items held or worn by a speaker at the podium or worn by a member of the audience, even though such items may be televised through the cameras that view the audience and the dais. As we had prepared a presentation and had not given it to the City, it was pointless for us to go up to City Hall. However, the real issue here is what one speaker last night termed “prior restraint” of speech. As graphics and images are a form of speech, the City is essentially saying that they have the legal authority to approve what you say and what you present to the City Council before you say it. Suddenly, in one fell swoop, the City Council of Palm Bay has determined what they will and will not hear from speakers and presenters in a limited public forum. It is as if the City and City Attorney Andrew Lannon have never even heard of the First Amendment. After public comments on the issue, Councilman Bailey picked up the Constitutional ball and asked Lannon if the new rule was prior restraint and Constitutional. Bailey also asked for any law or citation that would allow such censorship. Incredibly, while maintaining that the rule was legal, Lannon could not offer any legal support for the law. We find this amazing. We truly do. One of the things that one hopes is happening within the City is that the City Attorney does basic research to ensure that a rule or ordinance is Constitutional. What we are forced to conclude is that there was no research done on this at all. If there were, the law and cases would be fresh in Lannon’s mind. As they were not…..
We have an opinion on where this rule came from, and we’ll address that in a moment. Lannon justified the rule by saying the City had the right to not show things that were “offensive.” He gave two examples. The first was a reference to a film on 9/11 that was shown to the Council years ago that had graphic images within it. The second case was that he said the City could prevent the “f-word” from being used. Bailey asked how many times such a situation where something “offensive” was in a presentation had occurred. Lannon could only repeat the 9/11 video and a desire to protect someone from hearing the “f-word.” That answer leaves us less than convinced of the need for this rule, even it if were Constitutional. Unable to demonstrate his command of the subject, Lannon said that he would prepare a memo for the Council members as to why the rule as acceptable. Being the kind and caring folks we are, we are going to help him out. The Court made it clear that instead of restricting and or banning speech which someone in the government found “offensive,” the government had to support the right of the speech to be heard. And the “f-word” that Lannon is so concerned with? Finally, in arguments before this Court, much has been made of the claim that Cohen’s distasteful mode of expression was thrust upon unwilling or unsuspecting viewers, and that the State might therefore legitimately act as it did in order to protect the sensitive from otherwise unavoidable exposure to appellant’s crude form of protest. Of course, the mere presumed presence of unwitting listeners or viewers does not serve automatically to justify curtailing all speech capable of giving offense. See, e.g., Organization for a Better Austin v. Keefe, 402 U.S. 415 (1971). Still, it is depressing but not surprising that the City Attorney who is taking home large amounts of taxpayer dollars, cannot even cite a single law or case that supports this new rule. After Bailey failed to get an answer from Lannon, (and we are going to try to transcribe the entire discussion later) Councilman Holton (Pizza! Pizza! (tm.)) spoke up and asked two of the more bizarre questions we have heard in awhile. First, Holton asked Lannon if the City of Palm Bay of Palm Bay, in his opinion, did more than other municipalities in regards to supporting the First Amendment. Lannon agreed that they did. Bailey asked but never got an answer as to whether that was a fact or Lannon’s opinion. Yet Holton’s question is ridiculous. Think about it for a moment. The Council, the City Manager and the City Attorney all take oaths to support the Constitution. They have sworn to support and uphold the First Amendment. That support is a bright line. It is not a percentage or fungible. Here’s what we mean. Assume for a moment that the municipality of “Sometown, FL” supports the First Amendment 50% of the time. The other 50% of the time, they try to suppress speech. Assume further that the City of Palm Bay supports free speech and the First Amendment 90% of the time. While basic math tells us all that 90% of the time is greater than 50% of the time, the fact of the matter is that the only number and percentage that matters is whether the City of Palm Bay supports speech and the First Amendment 100 percent of the time. That’s it. There is no “atta boy” or “hooray!” for supporting the First Amendment part of the time. Holton asked in what was more of a statement saying Brevard County has the same requirement for handing in graphic items. The logical fallacy there is that this is the same County government which briefly proposed a “Civility Ordinance” that was supposedly vetted by the County Attorney that would have stripped citizens of their First Amendment rights. 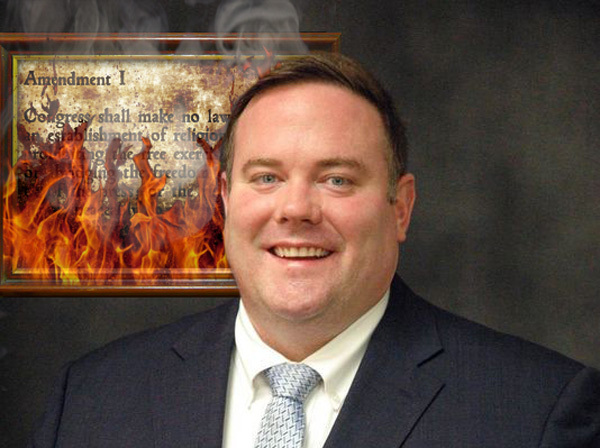 How great is it that Holton is supporting the Brevard County Commission who hates the First Amendment too? How outstanding is it that Palm Bay should be looking to a group that doesn’t support the First Amendment for citizens as shining example? Stay tuned as we are certain this will start to heat up as time passes. On review, the appellate court stated that both the United States Constitution and the Florida Constitution prohibit laws that curtail either freedom of speech or freedom of the press; a prior restraint on publication is presumptively unconstitutional. So the reason Lannon could not state statute to Mr. Bailey, is because it does not exist. I did see Thomas Gaume educate the council, I found it a shame it was so far over their heads, that I am nervous. Do they know what they swore an oath to? Lannon works for the City Council. So when you have a rule that is passed by consent, he is going to protect that rule no matter what it violates. As proof, I remind you of Scott Knox’s (Brevard County Attorney) who helped write Commissioner Curt Smith” odious “Civility Pledge” that could have resulted in second degree misdemeanor charges being filed against a citizen who uttered “slanderous” remarks and refused to stop speaking and sit down. Isn’t ironic that Lannon is actively seeking the County Attorney position now that Knox has retired? Maybe this incident with Palm Bay is a way of showing that he can follow the Council / Commission rather than his oath.